In​ my pressed penny bracelet tutorial, I showed readers how to create a linked bracelet using machine-pressed coins. The first parts of the tutorial are all fun and games... especially the part where you get to visit tourist destinations to come face-to-face with a penny smasher. Then, we measure out and plan our bracelet, choosing the best of our pennies or creating a theme. Now it's time to drill hammer your coins. You may have seen some tutorials online that advise drilling through your pennies to create nice, neat little holes. Be advised, dear readers, that drilling pennies for pressed penny jewelry will produce evil little corkscrews that are surely hell-bent on finding their way inside your foot. Or your dog's foot. Or whatever foot they can get their grubby mitts on, most likely bouncing around like the thousand alligator tongues from James and the Giant Peach. These tiny spirals will need to be diligently picked up and disposed of, immediately after each drill. In addition, there are little specks of metal lingering, too, what I like to call glitter's evil cousin. If you've got a workshop where you do all of your drilling; a place where slivers of tetanus are welcome to linger, then by all means, get your drill on. But for the rest of us who are in their living rooms or on the front porch just trying to presto-change-o a bracelet out of pennies, let's turn to that simple dynamic duo; hammer and nail. In my new pressed penny bracelet tutorial, I'll show you how to use a simple hammer and nail to create the holes needed to link your flattened coins. Drilling has its place in jewelry making, but I think that, in the case of drilling pressed coins, we should leave the drill out and not make things more complicated than they need to be. A hammer and nail work just as well, and won't create tiny metal worms that crave human flesh. To put a hole in a pressed coin, you don't need a lot of electric frills and drills. The metal is already so thin that a nail will go right through it. Step 1: Get a board. A 2x4 scrap will work fine, or even just work on a table that you aren't afraid to drive a nail through. Step 2: Grab a clamp. My husband fetched a vice clamp from the garage and attached my board to our gardening table. This worked great. If you don't have a clamp, I guarantee a neighbor does. This bit might not sound important, but keeping the pressed coin still and close to the nailing surface is imperative to effectively hammering it. 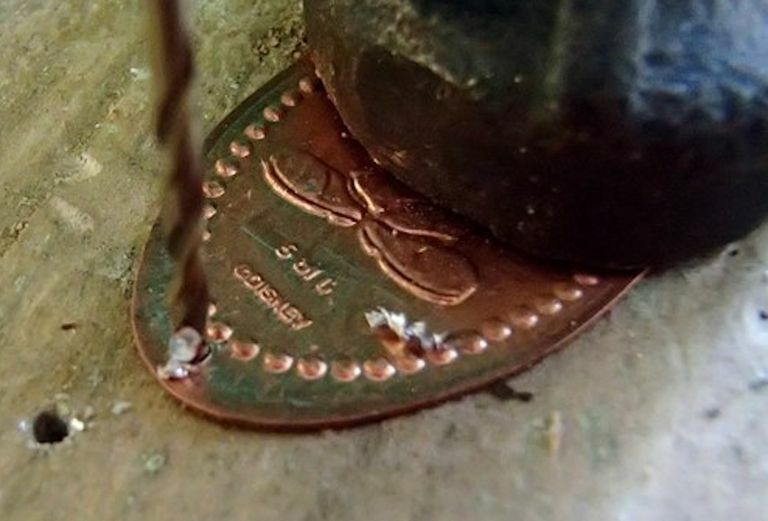 Step 3: Mark where you'd like the hole in your penny to be, bearing in mind that the diameter of the nail will make your hole larger, and closer to the edge. Be generous, allowing at least 1/8" for a small carpenter's nail. Step 4: Whack. Well, not at first. Make a few precarious taps to get a good dent going in the metal, so that the tip of your nail is nice and anchored in there. From there, hammer until the full diameter of the nail is through. Step 5: Remove the nail, then flip the penny over. Are there curls of metal where the nail exited the coin? Gently hammer these down back onto the penny. If they cover the hole, just put in the nail and hammer it through the other way. Once should do it. Of course, drilling can come in handy if you are making very large holes in pressed coins for special projects. Usually, for linking pressed coins, these small holes will do the trick.